WITCH members Jessica Caponigro, Chiara Galimberti, and Amaranta Isyemille Ramos cast a spell against gentrification in Logan Square. At first it was not clear where the ritual hex would be performed. Then three women strode purposefully across Kedzie Avenue, black capes blowing in the wind. They stopped at the corner of Kedzie and Milwaukee and proceeded to unload a large bundle of black pens, a lighter, several sticks of incense, comment cards, stickers, and a packet of neatly printed half-sheets detailing the hex and the protective spell of the day, in both English and Spanish. The women were part of the Women's International Terrorist Conspiracy From Hell, or WITCH, a performance collective founded in the 1960s and recently revived in Chicago to draw attention to inequality. In the 60s, WITCH members hexed the chair of the sociology department at the University of Chicago, who had recently fired a popular female professor, as well as the CTA, in protest of a fare hike. "Witches were the first guerrilla warriors and resistance fighters," the group's manifesto reads. "In its very inception, witchcraft was an act of social protest, and witches sought to address the needs of the least powerful and to share their knowledge and skills to fight oppression." About 40 people gathered to witness and participate in the hex casting. 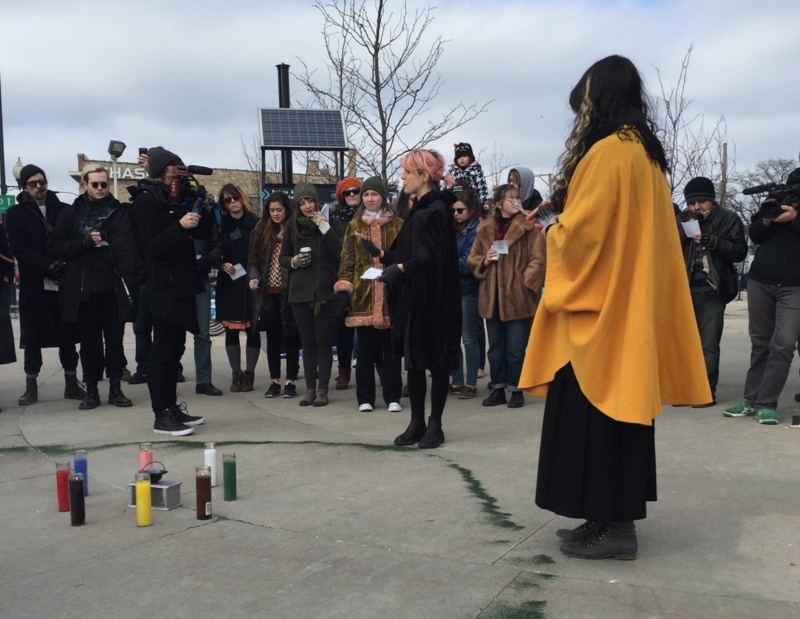 On Saturday, WITCH was back in action outside the Logan Square Blue Line station. Led by Jessica Caponigro, Chiara Galimberti, and Amaranta Isyemille Ramos—artists, writers, and activists in their spare time—a group of around 40 people gathered to cast spells, perform curses, and speak out against housing insecurity in Logan Square. Rapid high-end development, including the construction of the 606 elevated trail, has worried many longtime residents, who fear that housing prices are rising too quickly and will soon push them out. Currently about 10 percent of residential development must be reserved for affordable housing, but many locals say that isn't enough; a recent study by the Metropolitan Planning Council found that more than half of renters in Logan Square pay more for housing than they can afford. The witches aimed to cast a protective spell over the neighborhood, and to hex those who profit from what they deem irresponsible development. To begin, Caponigro, Galimberti, and Ramos poured a circle of fine green dust on the ground. Then they stood on the circle's edges and began to chant. "Rahm, Mark Fischer, and slumlords the same / Your predatory practices are a shame," they intoned, taking aim at the mayor and flubbing the name of controversial Logan Square property owner Mark Fishman. They encouraged the crowd to join in as smoke bubbled up from a tiny cauldron in the center of the ring and the smell of incense filled the air. Candles flickered on and off in the wind; cars whizzed by. "You benefit from inequality, it's agreed," they chanted. "Let's banish the curse of their toxic greed." Cassandra Nuckolls, an elegant woman with impeccable makeup and dangling owl earrings, watched the spell casting from about ten feet away. "I like to see what the young witches look like," Nuckolls said, surveying the scene, "because I'm an old witch." Nuckolls has lived in Logan Square for the past 25 years. She said she was glad to see young witches casting a spell to prevent the neighborhood from "growing too quickly." She held a large rectangular crystal wrapped in blue cloth, a protective amulet that she inherited from her grandmother. Throughout the ceremony she chatted congenially with a CTA official in a bright orange vest, also basking in the scene. Back in the witching circle, participants wrote down their experiences with housing insecurity and taped their notes to the side of the CTA entrance. "I've lived in Chicago all of my life, but have never moved out of my parents' building because I could never afford it," one note read. 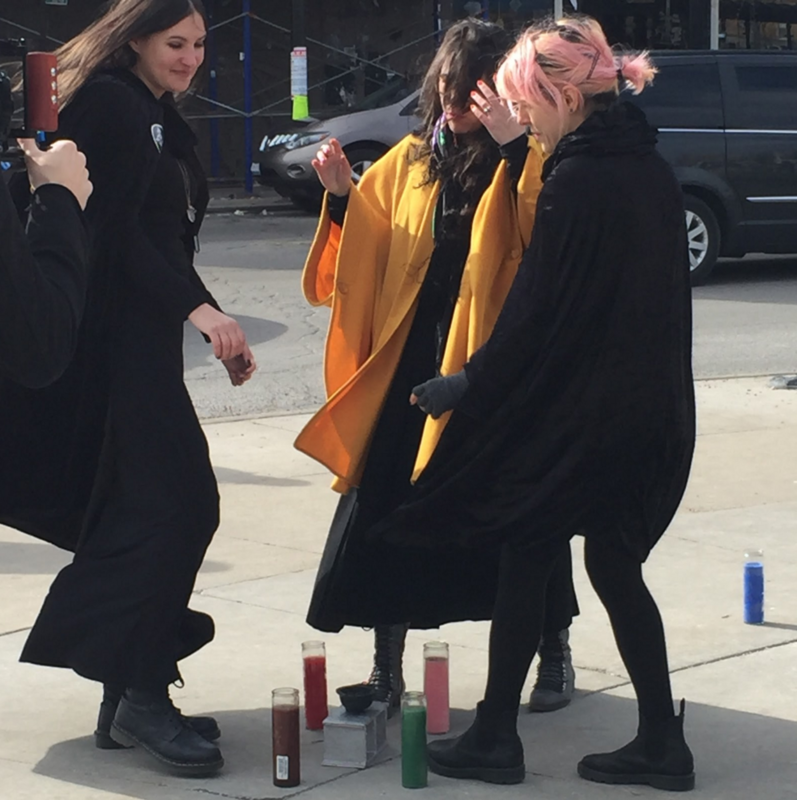 Three young women who attend DePaul said they were so excited to come to the ritual that they showed up at the Logan Square stop last Saturday before realizing they had the wrong day. Although they live in Lincoln Park and Wrigleyville, they made the trek again this week. "We've never seen a seance before," one said. "This wasn't a seance," her friend corrected. "Well, we were interested in their culture," the first woman explained. The women noted that gentrification is a particularly important issue to them, because landlords are raising prices so high that only college students with parents able to pay extraordinary fees can live in certain parts of the city, they said. "We're all super hungover," one of the women added. "But I'm glad we're here and not sleeping." The ceremony lasted about half an hour. Afterwards, the witches and their companions dispersed into the bustling neighborhood, the smell of incense wafting sweetly in the cold morning air. Kristen Sollée explained our current witchy moment, with detours into mythology, theology, and Bewitched. Is the Bloomingdale Trail a path to displacement? Longtime residents of Humboldt Park, Logan Square, and other areas around the highly anticipated 606 project are organizing to make sure they're not priced out of their neighborhoods. Mark Fishman has left the I AM Logan Square board of directors, and Amie Sell's censored Logan Square artwork is on display. Festivalgoers never got the chance to see Amie Sell's antigentrification piece Home Sweet Home. Legislators want to eliminate a tax they say unfairly targets women.